Because of the close proximity to the coast of Florida the Bahamas makes a perfect vacation destination. Bahamas cruises are popular with travelers of all ages, and because so many lines use this lovely island chain for ports of call, vacationers can get great deals with the competing companies vying for that all important vacation dollar. With many different departure ports to choose from, cruises to the Bahamas make short vacations or weekend getaways possible, with Freeport on Grand Bahama Island only 70 miles east of Palm Beach, the Bahamas and all that they offer are just a short hop, skip and a jump away from home. 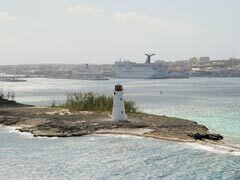 A perk with cruising to the Bahamas is that you get to see two or more islands and explore all there is to see and do on them all in one vacation. If you travel with certain cruise lines, you also get an exclusive stop at the port of call that they either lease or outwardly own, making your cruise unique to the many others traveling in the area. Disney’s Castaway Cay offers typical Disney fun in the sun with their themed island getaway that features swimming with rays, snorkeling in a safe, family friendly area and plenty to do for guests of all ages, including an adults only beach and teen only zone as well as activities to entertain the little ones in your party as well. On Royal Caribbean cruises, you can enjoy the sights and sounds of Coco Cay, an island on the Berry Chain which encompasses 140 acres. Here you can also snorkel, shop or lounge on the warm sand on the vast expanse of beach. About 70 miles east of Nassau is Princess Cay, the private spot for those traveling with Princess Cruises. On Norwegian Cruise Lines, you make a stop in Great Stirrup Cay, which features play areas, a bandstand and beachfront cabanas for relaxing in style. Holland America, not to be outdone by its competition offers Bahamas cruises that also stop in Half Moon Cay. This lovely island is about 100 miles south of Nassau and offers cruisers 9 miles of sandy beach in a carefully maintained ecosystem for all to enjoy. Two of the main cruise destinations for most cruises to the Bahamas are Freeport and Nassau. Freeport on Grand Bahama Island is the one most northernmost in the Bahamian chain. It boasts casinos, nightlife and plenty of things to do in and on its crystal clear waters and warm sandy beaches. A short jaunt from Freeport gets you to the Lucaya area of the island where visitors to the Bahamas can dive in underwater caves at the Lucayan National Park or take in the marvellous dive spots that wrap around Lucaya Beach which are loaded with reefs and marine life. 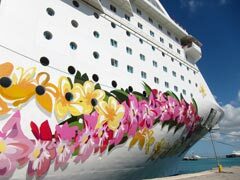 Spring Break cruises to Grand Bahama Island are big business, as day cruises that act more like ferries between Ft. Lauderdale and the Bahamas are commonplace, not to mention cost effective. Travelers can leave Florida at 7:45am and get to the Island at 1pm. There are return trips where you can choose to spend just the day or multiple days on the island before heading back home. Go Bahama offers cruises from West Palm Beach to Grand Bahama Island that you can use much like a bus. Cruise in, pick the number of nights on the island in multiples of two and then catch the next boat back to Florida. 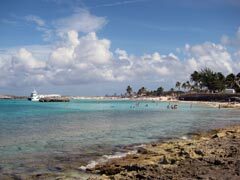 Nassau serves as the capital of the Bahamas and offers travelers British Colonial charm in a tropical paradise. Along with the many Vegas style casinos and beaches are 5 Star resorts, world famous Cable Beach and visitor attractions like Ardastra Gardens where pink flamingoes parade around with peacocks and tropical plants and flowers. The Pirates of Nassau is an interactive museum where kids and adults alike can have a ball, dressing up as a pirate and exploring their history and lore, and for those who like a challenge you can try the Queens Staircase, with 66 steps to the top all carved in rock. A bridge from Nassau takes you over to Paradise Island and the amazing Atlantis Resort. For a fee, people not staying in the hotel can still partake in some of her wonders, which include multiple lagoons full of marine life, a 141 acre water park and many more attractions that are all built around the mythical legend of Atlantis and the teeming sea life that is abundant in the Caribbean. Cruising to the Bahamas from ports along Florida’s eastern coast make for short trips to a great destination. They are inexpensive yet still allow for you to experience life on a ship before you make your first port of call. The Bahamas has it all and so close to home, too.